Well, I was wrong again when the rumor of a Canon EF-S 17-55mm lens surfaced. 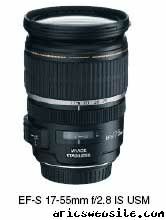 I incorrectly guessed that the 17-55mm EF-S would be a replacement for the EF-S 18-55mm “kit lens”. People had speculated that a 17-55mm with f/2.8 or image stabilization would fit nicely into Canon’s lineup. I, as well as others, speculated that Canon would not build a f/2.8 EF-S lens, much less build image stabilization into an EF-S f/2.8. Frankly, I’m a little surprised.. although if the price is right (and EF-S is supposed to be cheaper, right?! ), I’d really consider this lens..
UPDATE 3:19PM: Here’s a pic taken from the Canon 30D White Paper.. MSRP $1,149! Oh, also, I wanted to say something about Canon’s 30D . Reading lots of the posts over at the quagmine known as dpreview.com, you’ll read lots of posts about how Canon has let “us” down with the 30D (since its only a slight upgrade to the 20D).. you’ll hear people proclaim that they’re going to abandon the Canon line in favor of the Nikon D200..
What I dont understand is, what the hell are these people talking about? If you own a 20D, were you really that serious about upgrading to the 30D (now before you call me a hipocrate, I’m in a slightly different situation and yes, I will be upgrading)? When I had my Canon Digital Rebel 300D, I watched patiently as hordes of people flocked to the Digital Rebel XT 350D or even the Canon 20D. I definitely could’ve used the upgrade from 300D to 350D. I played with the numbers, trying to figure out an economical way of upgrading.. but in the end, it was hard to justify for me. It wasn’t until I started shooting more motorsports until I really could appreciate an upgrade. But by the time I had made that decision, my Digital Rebel 300D had about 11,000 actuations on the shutter. To many, that’s a lifetime of pictures. To me, it was about a years worth. To Canon, that’s about a 1/3 of the useful life of the 300D’s shutter (I think). I’d be willing to bet that a lot of the people who complain about the Canon 30D not being worth the upgrade from a 20D are people with less than 5,00o actuations, maybe even less. In other words, I doubt these people have even used their Canon 20D’s to the point that their camera has outlived its usefulness. Even then, I had toyed with the idea of keeping my 300D because it still took great pictures. The Canon 30D is not meant to address 20D upgraders. For Canon to honestly believe that a fair amount of existing Canon 20D owners were going to pull the trigger and pay for the upgrade to a 30D would’ve been ridiculous. I’m sure they’d love to believe that, but I’d bet the market research (and in most cases, the pure common sense of the idea) don’t support that belief. Rather, the Canon 30D is meant to address those upgrading from the D30, D60, 10D, 300D, or even the 350D. Following this line of reasoning, the Canon 5D is meant for people wishing to upgrade from the Canon 20D, 350D, 300D, etc. In fact, now rumors are circulating that a lower-priced, “de-tuned”, Canon 5D will make its way to market sometime before or around June 2006. As much as I would like a full-frame DSLR, if the Canon 5D is only 3fps, I’m sure the Canon 5D “Lite” isn’t going to be faster than that. And unfortunately, I love the speed of the Canon 20D/30D . Think about this.. Canon will price the 30D slightly above the Nikon D70s. Although it is debatable, I think most would agree the Canon 30D will be a better option over a Nikon D70s. Now, price the 30D below the Nikon D200 to appeal to the price sensitive consumers wishing to explore DSLRs. Now, introduce a full-frame camera that will smoke any APS-C crop sensor DSLR. Price that slightly above the Nikon D200. Its conceivable that Canon could effectively position their products at price points that could make the Nikon lineup non-competitive. Nikon will have basically brought a “knife” to Canon’s “gun” fight. 2. Nikon’s D50 can’t compare to Canon’s 350D even though the D50 is cheaper. Meaning, the small increase in price is justified in purchasing the 350D. 6. Should he/she pay $1700 for a 1.5x 10mp camera or a $2,000 12mp full-frame camera? True, all this depends on whether or not Canon introduces a 5D Lite, but based on my scenario, what do you think? Keep in mind, all this marketing crap is directed towards NEW DSLR owners. Once you’ve collected enough Canon lenses, Canon has to assume they’ve won your business and brand loyalty. True, its not always the case, but thats kind of like buying 3 Honda engines for your Civic, then buying a Chevy for your next car, its mostly illogical. Ford vs. Chevy; Mitsu vs. Subie; Canon vs. Nikon… all comes down to what collection of lenses you already have. for someone starting out fresh w/o any lenses, I would say go for Canon ‘cus you get more bang for your buck with Canon lenses vs. Nikon. same thing with a car, if you invested in JDM parts on a WRX, more logical to move those over to a STi (if compatible) than to buy an Evo and start all over. however… I want to point out that used lenses, unlike used car parts get reasonable resale on eBay.